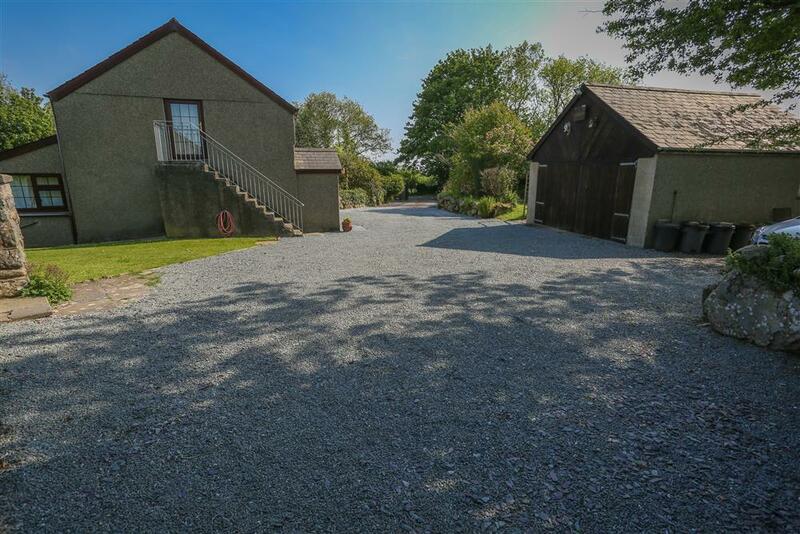 Open countryside and farmland surround this 18th century stone farmhouse and converted granary, with a private indoor swimming pool, situated near the village of Llangybi, between the seaside village of Cricieth (5 mls) and the market town of Pwllheli (7 mls). Porthmadog and the sandy beaches of Black Rock Sands are 10 mls. It has been recently decorated and furnished in a style contemporary to the age of the cottage, which complements the original features such as the open fire in the large inglenook fireplace. It has many returning guests that enjoy the homely welcome the house offers. There is one downstairs bedroom, 3 bedrooms in the farmhouse and 2 further bedrooms in the attached granary, accessed by a second staircase. There is a gated drive, a large parking area to the front and the whole of the garden and grounds are surrounded by a 4 ft stone wall. There are two small ponds in the back garden - one for the fish and the other a bridged wildlife pond for frogs and newts. 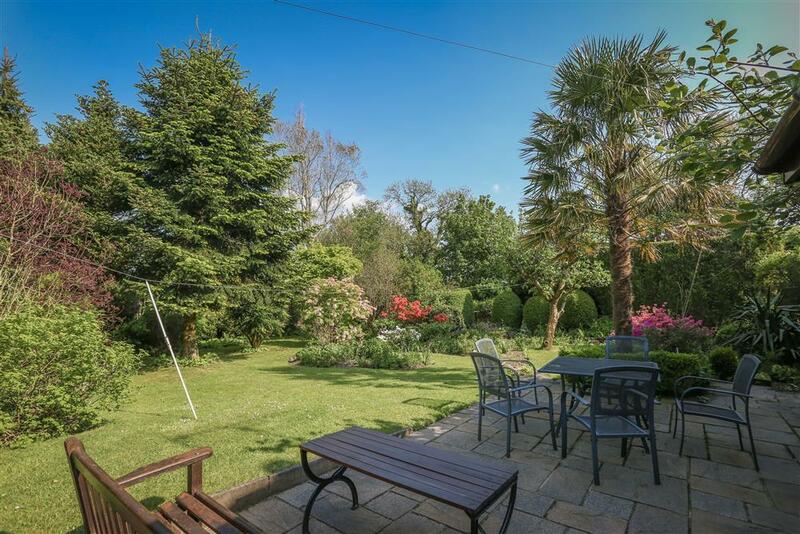 The serene countryside setting has a wealth of country lanes, bridle paths and footpaths to wander to enjoy the fresh air. Particularly beautiful nearby is the hidden valley of Cwm Pennant, which follows the river Dwyfor upstream for enjoyable walking and rambling. Cricieth (5 mls) has a historic castle and a quaint selection of shops and good restaurants. Porthmadog (10 mls) is most noted for its leisure harbour and the Ffestiniog Railways steam trains, it too has gift shops and restaurants to please all tastes. The mountains of the Snowdonia National Park is just beyond Porthmadog with Beddgelert village (16 mls) nestling at the foot of Snowdon, Portmeirion 'Italianate' village (13 mls). Duvet covers are provided but you will need to bring your own sheets, pillowcases, towels & tea towels. Bed linen and towels are available to hire localy at £250. SHOWER ROOM/WC with shower cubicle, HWB and WC on the ground floor (1 step up from the lounge and ground floor bedroom). LOUNGE AND SNUG: Comfy seating for 12 adults in a large room with a little snug, Smart TV, open fire in large inglenook, French doors from the snug area to rear, enclosed cottage garden with ponds. KITCHEN with four ring electric cooker with double oven, microwave. INDOOR SWIMMING POOL: Separate from the farmhouse is a heated indoor swimming pool in a converted barn with a sun roof for sunlight. It is to be used by the guests at The Tree House ONLY! Pool size: 28 ft x 13 ft, depth 3 ft to 6 ft. There is no lifeguard provided so please be aware that children will need to be supervised by a responsible adult. The pool is heated Easter to end of October. You are welcome to use it at other times, but the room is unheated and cold in the winter. Past guests have used wet suits in the pool in the winter. GARDEN: Large, enclosed with patio furniture and views with an upper lawn up some steps. HEATING: Economy 7 heating included throughout, as well as the open fireplace in the lounge. PETS: No limit to well behaved dogs. Garden surrounded by farmland with livestock. LINEN: No, but duvets and 2 pillows are supplied. Please bring your own sheets, duvet covers and pillow cases. This property does not accept mini-breaks, only weekly bookings. Mrs E (October, 2018): "The farmhouse was lovley plenty of space the only minus was the beds were uncomfortable ,the gardens were lovley and to sit quietly in the snug and watch the birds in the garden was special the swimming pool was excellent was in there twice every day." Miss C (September, 2018): "Nice house with all the necessary. Clean and comfy, just like what I saw in the pictures. The swimming pool amazing. To find the house you must follow the link to the front door otherwise (in the paperwork from STS) a bit difficult to find. It was a lovely week." Mr D (July, 2018): "This was an outstanding property, well run and maintained. Well located for exploring. We loved it!" Ms W (April 2018): "We loved this place it was perfect for our two families! The space was great, we had our own separate areas of the house and the living room and kitchen were perfect for getting together! The children loved the swimming pool and spent a good few hours in it! We couldn't get the outside tap to work this would have been good to wash off boots and dogs. (Mentioned to the owners when we saw them) If I had to be picky it would have been good to have a room with twin beds and maybe a slightly bigger fridge but this is not a negative in anyway." Parking to front on gravelled drive. Footpath to front door with one small step into the house. All doors are standard width. The whole of the ground floor of the farmhouse and granary are joined with one step up from the lounge (Farmhouse) to the kitchen (Granary). There is a bedroom with a double bed and single bed on the ground floor next to the lounge. There is a shower room/wc on the ground floor but there is one step between the bedroom and this room which is through the lounge and just off the kitchen. There are two seperate staircases with hand rails. In the farmhouse the hand rail is on the left hand side ? ascending to the first floor, 3 bedrooms and bathroo/wc. The staircase in the Granary part is slightly narrower than modern staircases with a hand rail on the left hand side?. There are additional external accesses from the Snug area through French doors into the enclosed garden and Dining room through a single door to front and towards the barn where the Swimming pool is. The Swimming pool is private and there are no lifeguards. There are metal steps into the pool. How many nights? 3 nights 4 nights 5 nights 6 nights 7 nights 14 nights 21 nights How many adults? 0 1 2 3 4 5 6 7 8 9 10 11 12 13 14 How many children? 0 1 2 3 4 5 6 7 8 9 10 11 12 13 14 How many infants*?